Review: Everyone is going to die someday, but there is one way that is scarier than most: cancer. To be sure, there are a lot of horrible illnesses, but there is little more alarming than having the doctor say, “It’s cancer.” What makes it even more horrific is if the patient has yet to reach adulthood and the prognosis is bleak. Such is the case in Selene Castrovilla’s novel, The Girl Next Door. Jesse must face a terminal illness, and right by his side through everything is Samantha, the girl who lives next door to him. Jesse is a senior in high school – an all-around perfect guy, until he gets the news that he has cancer. With only a 4% chance of survival, Jesse’s world comes crashing down all around him. His father ran off when he was just a boy, his mother drinks too much to be able to support him, but he has Sam. He and Sam have been best of friends ever since they were in strollers, and their friendship is what gets Jesse from day to day as he faces rounds of chemotherapy and radiation. Sam, once an honor student, is failing out of high school because her only thought in life is Jesse. She sleeps in his room and helps him through the good and the bad. As Jesse’s cancer grows, so does their love for one another. But, will their love be enough to overcome the odds? The Girl Next Door packs in so many emotions in a short amount of pages. It’s a roller coaster ride from beginning to end. Sam and Jesse have an enviable relationship – starting as friends and turning into lovers. They must find a way to have an adult relationship while dealing with the worst life has to offer. The reader is allowed into the mind of a dying teen as he goes from hatred and anger – wanting to shut himself off from everything that reminds him of what he’s losing – to acceptance and peace. The reader also gets to see firsthand the effect cancer has on those left behind. Sam’s emotions are all across the board. She wants so desperately for Jesse to fight to live another day, and then she questions her motivations. She asks the questions everyone wants to ask: “Why had I insisted, bullied him into this? For him, or for me? I’d wanted him to fight, and to try everything, but wasn’t that selfish when I wasn’t the one whose life was at stake?” Sam must deal with being an insecure teen, and be thrust into adulthood well before she’s ready. 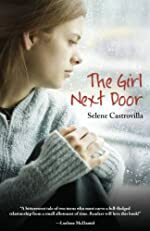 But The Girl Next Door shows that sometimes the worst of times bring out the best in people. Jesse and Sam grow and mature throughout the book and their relationship should be a model for others. As Jesse and Sam’s relationship grows, so does Jesse’s relationship with his mother. Readers can’t help but be moved as the walls between Jesse and his mother slowly crumble. Castrovilla has taken a horrific situation and made it into a warm, thought-provoking book that will keep readers thinking long after the last page is turned. We would like to thank JKSCommunications for providing a copy of The Girl Next Door for this review. Have you read The Girl Next Door? How would you rate it?